A few days before leaving for hajj back in the beginning of October, it became a “use everything up in the kitchen that could potentially go bad” night. Which meant it was a seafood night. My mom made fried fish and I made my Bang Bang Shrimp. Oh and I made cheesecake. What better way to use up cream cheese?! 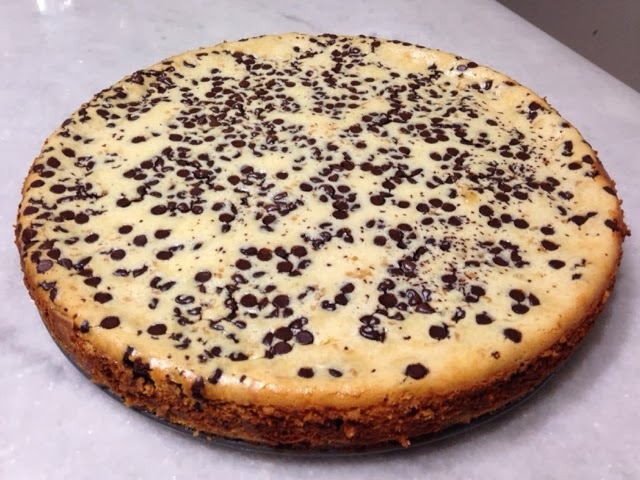 A chocolate chip cheesecake with a pistachio based crust to be exact. Preheat your oven to 350 degrees for the crust. Roughly chop your pistachios, and set aside. Cream together your stick of butter and 1/4 cup of sugar. Add flour in small batches until it is just combined, with your mixer on the low speed [to avoid getting flour all over you]. Mix in your chopped pistachios and 1 teaspoon of vanilla extract. Press the crust, gently, into the bottom and along the sides somewhat [I’d say about 1/4 of the way up] of a greased/non-stick springform pan. Bake in your preheated oven, for around 10 minutes until the crust turns barely golden brown. Lower heat to 300 and bake cheesecake for an hour. Cream together your cream cheese and the condensed milk until it is smooth. Next, add in the eggs and vanilla extract. Do not over beat the mixture, just until it is all incorporated. Pour half of of your cheesecake batter on top of the crust. 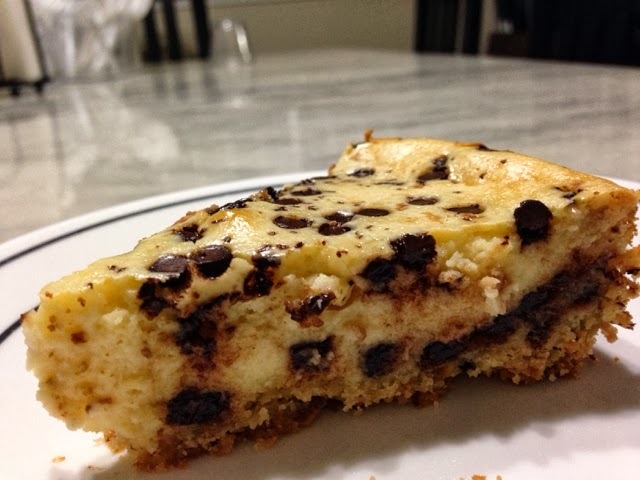 Sprinkle half of your chocolate chips on top of the cake batter before pouring the remainder of the cheesecake batter on top. Sprinkle the remainder of your chocolate chips on top. Bake [in your preheated 300 degree oven] for about 60 minutes. Let it cool [and completely set] for at least several hours [if you have the will power] before cutting into it. Before I went, a lot of the reading I did [which was A LOT] told me that everything is readily accessible to purchase upon my arrival. That may have been true, but I wasn’t going there to shop and wanted to utilize my time as best as I could. With me, I took along things I foresaw a need for. But I’ll be completely honest: packing was stressful. I had never been before and didn’t know exactly what I would need and kept a lot of things ‘I thought I may possibly need’ but didn’t actually need. I guess you can say I wanted to be prepared? I didn’t end up finishing my packing until the morning of my flight, which is very unlike me. For days I kept putting things in only to take them right back out. SO not worth the trouble/headache it caused me. The end result was that I packed a suitcase comprising of some things I didn’t necessarily need to bring along. What I would have loved was to have someone who had gone for hajj before tell me exactly what I would need and what was unnecessary. First and foremost, like I have mentioned several times thus far in my hajj posts, you need to have patience. And lots of it. Photocopies of travel documents. This goes without saying, but don’t forget your passports, etc. and I would suggest you keep photocopies of them in your luggage just as a precaution [considering your passports are taken from you for the duration of your trip]. Comfortable walking shoes [and socks]. Wearing socks, whenever possible, during tawaf and sa’ee helps in avoiding dry and patchy/blistering skin. Keep in mind that men can’t wear socks during the state of ihram [but women can]. Flip-flops: most convenient for the masjid. Vaseline. All the walking [barefoot for men during ihram] [in the tawaf and sa’ee especially] leads to patchy and dry feet. A [drawstring] bag. If your group doesn’t provide it for you [ours did]. Convenient to hold your flip-flops inside the masjid so you can keep it with you at all times. 1] Storing it outside doesn’t guarantee you’ll find it afterwards with the enormous crowd you are dealing with. 2] You may not leave from the same gate/door you entered from. for public bathrooms. You’ll thank me for it later. they are also great for when you are picking up pebbles for rami/jamarat. Prescribed medication that you take on a daily basis. Keep these on you at all times. Also, keep a list of all the medicines you take [along with their doses] and any medical conditions you may have in case of any emergencies that may arise there. Precautionary medicine. In case you fall ill. There are three million plus people there, mashallah, which means there are three million people’s worth of germs around… enough said. Pain relievers, antibiotics, cough drops, etc. Comfy and modest clothing. There are plenty of long days so you want to make sure your clothes are comfortable, but don’t forget the modesty part! Abayas [women]. I originally wasn’t sure if I was going to keep any and I ended up wearing them the majority of the time. They really are the easiest thing to wear. Bathroom slippers. These especially come in handy when taking a shower in Mena. TSA approved locks that don’t require a key. The last thing you need is another thing (keys for the locks) to be carrying/keeping track of. Snack bars. Our program, Dar el Salam, provided ample food but the snack bars I kept as a precaution came in very handy during the long bus rides when stuck in traffic. Disposable underwear. Laundry isn’t readily available and I found it easiest to purchase ample underwear from home and dispose of them after use. First aid kit essentials. Band-aids, anti-septic wipes, gauze, etc. just in case you need any of them. Hand sanitizer and hand sanitizer wipes. Travel converter/adapter [for your electronic devices]. Cross-body bag/purse. Keep this on you wherever you go to hold your essentials — medicines, dua books, etc. Face mask. It will help with the dust/smog/pollution/whatever you want to call it that you will inevitability face there outside. Toiletries. Basic toiletries are provided in the hotels, but you will need them for the duration of your stay in Mena [see below]. Scissors [women]. To cut your hair in order to get out of the state of ihram. 7-beaded string. This can potentially be helpful in keeping count during tawaf or sa’ee if you think you’ll have a hard time keeping track– we took one, but didn’t end up using it. Eyeglass cords. If you wear glasses, it’s a good idea to attach one of these cords. There’s a large crowd and it becomes very congested during tawafs– this way, if your glasses are knocked down, they are still around your neck! unscented toiletry items since you will be in ihram for a part of it [so I would recommend just packing only unscented items to save space]. Shampoo, toothpaste, soap, lotion, deodorant, flushable wipes, etc. 4 sets of clothes [one for each day]. Women may need more based on their discretion. Water-Proof bag to hold essenials/clothes during shower that has a handle that fits around shower handle. A family friend suggested this for the duration of our stay in Mena and I can’t thank her enough for it! While our camp had hooks behind the bathroom doors, I am pretty sure most don’t. Since the shower and toilet are unimaginably close, your best option is to have a bag that fits over the shower handle. Now for specifically for when you are in ihram [during umrah and hajj]: a whole lot of unscented/fragrance-free. for females: I was able to find a ‘Secret Outlast’ brand that was unscented [online]. for males: I found a ‘Dove Men+Care’ product that was unscented [online]. the brand ‘Wet Ones’ carries fragrance free [and alcohol free] hand wipes. Once you arrive, and you realize you forgot an essential or need something, chances are you can find it at a store called Bin-Dawood there. Someone called it the equivalent of Wal-mart… and I agree: just about everything can be found there! Take a picture of all of your luggage and make a note of it’s color, size, company, etc. in case it gets lost. In hindsight, it’s almost impossible to remember the details and it is just helpful to have handy. One last suggestion: keep your ihram [and items you need for Mena too I suppose] in your carry-on and don’t check-in these items on your flight. If, for whatever reason your luggage is misplaced, the last thing you want to lose is your ihram, etc.